Click the button below to add the The Perfect Fit Belt to your wish list. This belt came in the mail quickly made just right and moves with me on my day to day tasks. It makes my belts prior look and feel like thin bands that are unsturdy. A fantastic purchase for anyone who likes a reliable belt. 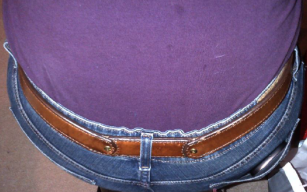 I've been wearing my Perfect Fit belt now for several weeks. It's by far the best gun belt I've owned in more than 30 years! It secures my IWB and OWB holsters with comfort and ease with leather second to none. It may cost a little more but "you get what you pay for!" They even sent me an email about the wrong sized buckle I included in the online order to ensure that's what I wanted. Superior customer service!! The hinge is the key. 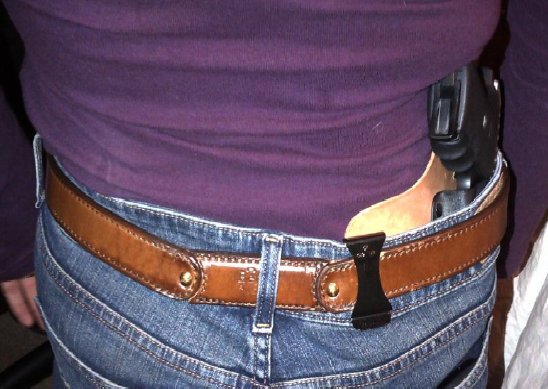 It allows the belt to ride with the movement of your body while remaining stiff where it needs to support the firearm. Its a better design and well executed manufacturing with high quality materials. Nothing better can be had at any price. Great customer service, very helpful in choosing the right belt, received the belt fast. Great price, Great workmanship. I would like to say thank you to both Mike and Tracy for the excellent product and perfect communication. It's a pleasure to deal with you, guys. Will by again from you and will refer all my friends to your services.